I've sold tens of thousands of books on which I earn 2.25% of the cover price. The implication being that 97.75% goes to someone who didn't write the words behind that cover. This blog is about those numbers and why I feel the situation to be reasonable. I'll say it up front for anyone lacking the stamina to read any further: I have no complaints whatsoever about my publishers. I am happy with the contract I signed. My royalty on a book depends upon the price at which the vendor purchases it from the publisher. 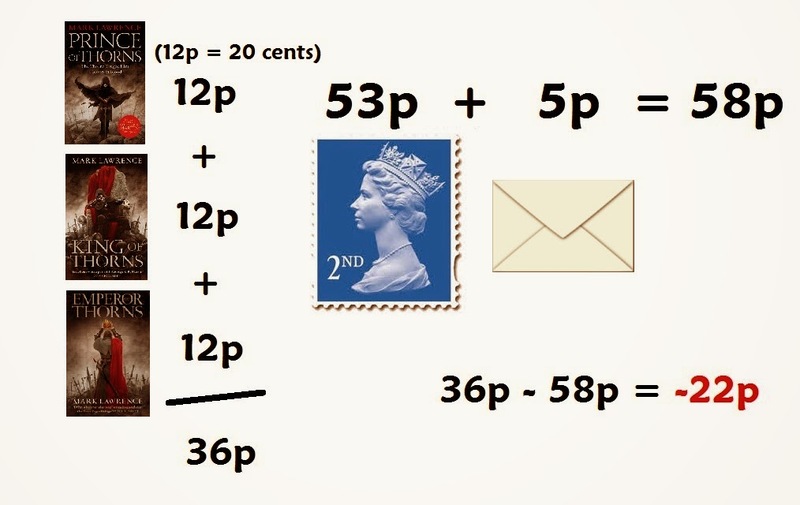 For paperbacks sold in the UK I get 4.5% of the cover price if the discount to the vendor is greater than 62.5%. I imagine a vendor gets that level of discount by buying in bulk. So Amazon for example will very likely get this discount, meaning I earn 4.5% of cover price on each paperback of mine they sell. However, because my UK publisher is a sub-contractor to my US publisher for the purposes of my work, my US publisher get 50% of any royalties accruing. So I get 2.25% of the cover price. 12 pence (20 cents) in my pocket. I very frequently get requests for signatures. The cheapest solution is to send a 'book plate', a sticky white label which I've signed and can be stuck in the book. Let's say you buy my whole trilogy in paperback from Amazon and ask me to send you my signature to stick in the books. A little arithmetic shows that I'd be out of pocket on the deal. 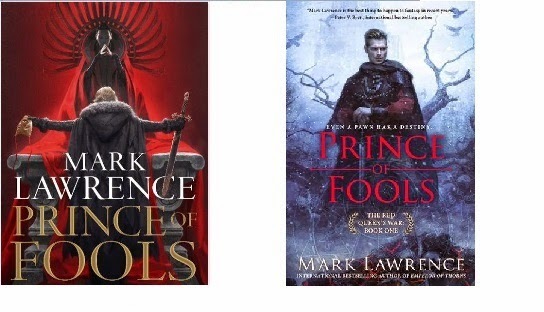 I'd still be out of pocket if you'd bought Prince of Fools from Amazon in paperback too! Another way of looking at it is that to make £1000 (the typical monthly rent on a 4 bedroom house where I live - I need 4 bedrooms, I have 3 children at home, one with complex needs) I would need to sell 8333 paperbacks on Amazon. A great many books do not sell 8000 copies in their lifespan, very few indeed sell 8000 a month! So, why do I think this is a reasonable state of affairs? Well, first let's caveat these figures by saying that I make significantly more per copy on ebooks, hardcovers, and even paperbacks from bricks and mortar stores probably make me more. Plus, you can double the figures if they're sold in the US. The first big point here though is that I was offered a good number of deals and signed the one I ended up with. I was under no pressure. The second big point is that I got a large advance. I much preferred getting that advance to getting a smaller one and possibly larger percentages of each book sold. I didn't know how many books I would sell - most books do not earn out their advance. Mine have, but I didn't know that they were going to and an advance is guaranteed money ahead of time that I don't have to pay back even if I sold just 3 copies. That security was very appealing. My publisher gambled that money on me. They took all the financial risk. The people behind it staked their professional judgement on my work. If the books had crashed and burned those people's careers would have been damaged, the money lost. If someone gambles and wins I don't then whine that they have lots of money. And where did they get the money to gamble in the first place? It came from profits made on successful authors. The very high-selling authors (the successful gambles) subsidize the new authors and allow them to be given a chance. Success is not guaranteed. I co-authored a book before my Prince of Thorns deal that was published after Prince of Thorns came out, and with a different publisher under a different name. We got a good advance. The book did not come close to earning out. Just as I am not complaining that on some books I make 12p a copy I am not complaining that on my less successful book if you divide the advance by the number sold I made a considerable sum per copy. Hopefully now I am helping to pay an advance for a new author a couple of places behind me in the queue. And whatever the percentage or absolute sum I make on copies sold, publishing is far from the most lucrative business on the planet. I have had personal contact over the past three years with publishers that have gone bust and with other publishers that have lost large sums and are struggling to survive. That, more than anything else, convinces me that far from being ripped off I am in fact being dealt with fairly. I know that in these heady days of self-publishing miracles it's popular to damn the greedy publishers and call for the cutting out of the 'middle men' ... but I just don't feel that way at all. The other day someone told me that whatever marketing publishers do is irrelevant because he had got hold of my book without any input from the publisher. He said that all an author need do is email a copy of their book to 20 'notable' bloggers and if it was any good they would be set. Here's the thing though - those 'notable' bloggers are drowning in books. They receive far more paper books than they can read, and many times more than that in ecopy from hopeful self-published authors. How do they decide what to pick? Very often it's a book that has a 'buzz', or they rely on the quality filtering done by major publishers and pick one from a well known imprint. Bloggers typically want to blog about books that other people have heard of and are likely to read. It's an enormously difficult thing to make it as a self-published author and those that succeed have my greatest respect. So the reason this guy had heard of my books in order to choose to read them was because other people were talking about them, and that process was seeded by my publishers putting their reputation behind my title and mailing copies to many bloggers/reviewers to give them the chance to read it. I couldn't agree with you more, Mr. Lawrence. While I haven't been paid for my fiction as of yet, I plan on making every dime through traditional publishing (assuming I'll make a dime eventually). I have nothing against self-publishing in general, but I feel traditional publishing should be the mainstay of publishing even through the ebook revolution. I find it fair for both writers and readers, "gatekeepers" considered. Wow, that's depressing... Why authors don't sell their books directly onto the web. Let say, you sell your book online 1$ (0.6 pound), keep 5-10% for the website maintenance and publicity, you'll get a more lot money in your pocket..? I believe that book distribution will change with the Internet, as mp3 did change the music industry. Because if you have a publishing deal you're not allowed to do that - it would be stealing from the publisher. And if you don't have a publishing deal ... almost nobody would ever come to your website and buy the book. Now that you are popular author, selling thousands of books, what about selling a new book, no publishing deal, on your own website? But anyhow, as I see this, that's pretty much impossible to live as an author, publishing deal or not. Selling your own books yourself for 1$ earns you less money than doing so for 20c with a publisher. When you have a deal with a publisher it's a great thing in that you don't need to do squat. The publisher does all the work and takes all the risks if you get a good advance, which you get to enjoy being lazy and happy at home. Well that would be ideal. It's not true, but it certainly is true that to succeed as a self-published author you will have to do a lot more non-writing work. It's nice to see authors talking candidly about this. It's a rare thing in general and to be applauded. The problem with the whole self-pub thing is, while the pay-off is potentially much greater, the chances of success are much slimmer. Definitely the path of a gambler. There are a lot of arguments against trad-publishing: slim profits, gatekeepers, blah blah blah. What they don't address though is that, eBooks aside, editing, designing, printing, marketing and selling books to people is really expensive. Prohibitively expensive for your average dude or dudette with a £1,000 rent and kids to feed. If you go self-pub, you're realistically confined to eBooks or at least print on demand sales. And like Mark said, it's not about being the greatest author that gets you noticed by the hype machine, it's sheer luck. By the way, I'm not decrying self-pub, not in the least. I'm all for self-determination and anti-establishmentarianism. However, if you want to make writing your full time job, it might be a gamble too far. Another caveat though, who knows what the landscape will look like in ten years? Ten years ago, self-publishing was almost unheard of! They do and they can, and it has, Fred. I sell online, and make £1.60 for each book I sell (at £2.50). It's all about the support system you think you need. To be honest...writing a book for me is the hard part, the publishing part is pretty easy. Takes me less than half an hour to get my book ready for prime-time. Mark, if you want a piece of advice from a self-published author who is making his living out of it - start self-publishing as soon as you can. You have a 'name', you have a reputation, you have a fan-base, and you deserve a darn sight more than 2.25% royalty for your work. I do have a name and a readership, it's true. But I also remember why I have those things, and being cursed with loyalty I'm minded to stick with my publishers. Fred go to smashwords (https://www.smashwords.com/) and you will have thousands of authors on that situation, 1% of those have talent and good books. And who guarantees which are good or bad?.. You would have to buy 20 books to find 1 with quality. Of course he already have fame now and could manage to sell is books to his fans through a website but without having books on the stores he would hardly conquer more fans. So by buying your books on Kindle I helped you financially as well as having nowhere to stick your signature and therefore not having cause to ask you to send me one? Win-win for you, and actually I don't care about a scribble on a piece of paper. I find it far more useful and interesting that you engage with your audience so much here and on social media. For sci-fi and fantasy books in particular, I find my kindle to be so much more practical and easy to read than paper books. Hardbacks look beautiful as ornaments but are heavy and awkward to read, and even paperbacks are heavy when it's a George R. R. Martin or Peter F. Hamilton book. In the last year or so I've read all the Song of Ice and Fire books, Peter F. Hamilton's Void Trilogy and your Broken Empire books, and they are all still on my Kindle with plenty of space to spare. I'd go so far as to say that buying my Kindle has re-ignited my interest in reading novels. I've probably read as many in the last year and a half as I did in the previous decade as paper books. I wonder, do you have numbers for the breakdown in the percentage of sales of your books that are physical copies as opposed to electronic ones? In the UK it's aboy 30% ebooks, in the US closer to 50%. That's quite an impressive market share considering that the technology has been around for less than ten years. Oddly enough although I bought your books on Kindle, I became aware of them while killing time browsing the sci-fi and fantasy section of a bookshop, so in my case at least, having a physical copy of your book in a bricks and mortar store generated you a sale which you wouldn't have had if you were self-publishing online. We are clearly in a period of transition at the moment, and I do think that the publishing industry will change, but I don't think that it will disappear entirely. I reckon that even if e-books replace paperbacks, there will continue to be a market for hardback books as objects to treasure, and as you say that help with the publicity is invaluable. It will be interesting to see how the industry adapts in the future. So very well said. Brava!!!!! A genius and a saint too! Oh and just so you know I would have never found you without your US publisher and the US Magazine I review for! Other than the cover art and the description on the back, marketing had nothing to do with me buying "Prince of Thorns". I just happened to stumble across it on a rainy day in an Irish bookstore while on holiday. But I was hooked so I bought the other two (as they came out) stateside! "I co-authored a book before my Prince of Thorns deal that was published after Prince of Thorns came out, and with a different publisher under a different name." I suspect I'm not the only one who wants to get their hands on this. Can you give us a hint as to the title? ainnirbard, the marketing may have had no direct effect, but certainly the publisher had an effect. That book likely wouldn't have been in that book store without Mark's publisher. And the marketing may even have had an effect on that. Big sales in larger chains (through marketing efforts) may have led to other stores to notice and eventually pick up Mark's book, making it available for sale in their limited shelf space. So don't write marketing off so easily. For the books that do well, that get buzz, it's very difficult to separate the publisher and their efforts from the equation. The same is true of plain word of mouth. It all feeds on itself (if you're lucky), and there's no telling what might have happened had you gone out on your own, or gone with a smaller publisher, or what have you. I have a slightly different perspective....but not that far off. In many ways publishing is a venture capital game. Publisher's take huge risks, and more often than not the horse they pick fails (stat's I've seen is somewhere between 10% and 20% of books earn out their advance). Because it is so high risk, they have to take a very high % of the profits...basically the successful authors are subsidizing the failures because if we were all pulling our weight then the shares to the author could be higher. Yes, there are a lot of people who are getting slices of the pie. The publisher, distributors, bookstores, agents, I could go on and on...and I think they provide valuable service that I appreciate and think they should be compensated for their efforts. But....what is the fair amount of sharing? I'm working on a contract for the audio rights of my next series, and as such I've done some analysis on the income from my first series. Here is what I discovered. In about a year my three Riyria books generated $1,310,655 worth of income to various parties (Audible, Recorded Books, Orbit, Myself, my agent). My cut? $47,090. Do I think that is fair? No, sorry I don't. What I would like to see is a sliding scale. Once the author earns out and the risk by the publisher has been recouped than more should start shifting to the author. The publisher is still going to be making a big profit but in some cases they are earning $12 to each $1 I make. I have no problem with that kind of split when they are earning back their investment. But the more I make, the greater the disparity between my income and theirs. A really fantastic post Mark. I really love hearing about the author's perspective and world from you. The amount you receive seems like daylight robbery to me, especially considering the author is the sole reason that product exists. Fantasy - crossing the border. Prince of Fools arrives at Voyager!